My Creative Existence: A Darkroom Door in a haunted house? Tonight I want to share pics of some ATC's that I made for the Darkroom Door Photobooth swap, hosted by the lovely Rachel herself! So look away now if you're in the swap and don't want to spoil the surprise! LOL! 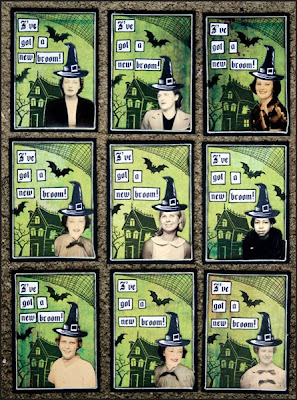 I have used Hero Arts stamps ("Happy Halloween" collectors edition) for the background images, and turned my photobooth ladies into witches! LOL! The green background is some Fancy Pants Christmas paper, and the words were printed out from my computer. 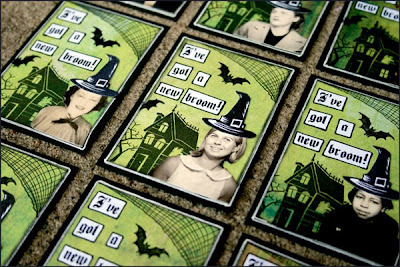 Love these spooky stamps! If you look very closely (you can click on the pics to enlarge them) you will see a little ghost popping out of the window of the haunted house! So cool! The ATC in the centre is the one that I will be keeping for myself - the others will all get swapped with ATC's from other ladies in the swap. I can't wait to see what comes back! It is a great pleasure to visit your nice and interesting blog for the first time. These are brilliant Sarah! Thanks for sharing. Love these Sarah! They arrived today and look even more fabulous in real life! !